Fig. 3. Strategy of proton pump inhibitor (PPI)-resistant Helicobacter pylori (H. pylori) eradication treatment. (A) Conventional strategy of H. pylori eradication treatment (an abridged edition of Management of Helicobacter pylori infection—the Maastricht V/Florence Consensus Report published by the European Helicobacter and Microbiota Study Group). In areas of low clarithromycin (CAM) resistance (< 15%), amoxicillin (AMX), CAM, and PPI triple therapy is the recommended first-line treatment. 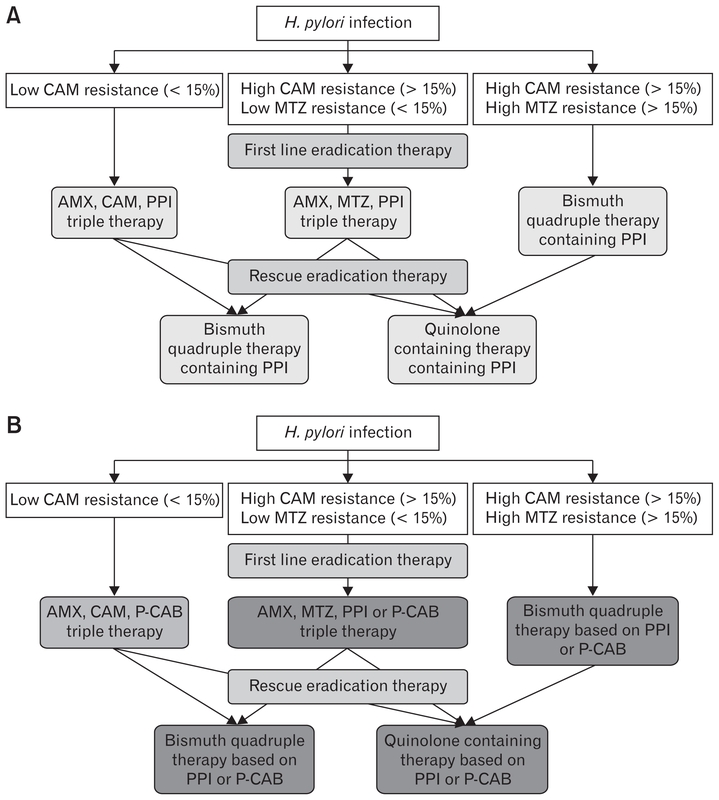 In areas of high CAM resistance (> 15%) and low metronidazole (MTZ) resistance (< 15%), AMX, MTZ, and PPI triple therapy is recommended. In areas of dual resistance, bismuth quadruple therapy is recommended. Quinolone containing therapy and bismuth quadruple therapy are recommended as rescue therapy. (B) The authors propose a new strategy of H. pylori eradication treatment. AMX, CAM, and potassium-competitive acid blocker (P-CAB) triple therapy is sufficient treatment even for CAM resistant strains. AMX, MTZ, P-CAB, or PPI triple therapy, quinolone containing therapy and bismuth quadruple therapy may be recommended as rescue therapy.